Being squeezed out of a job by forces way beyond one’s control can be a crushing and deflating experience for many. But it can also be the proverbial opportunity in disguise for ambitious and energetic entrepreneurial types like Stéphane Côté, founder and president of Solutech Packaging Systems in Richmond, Que., a one-hour drive northeast of Montreal. 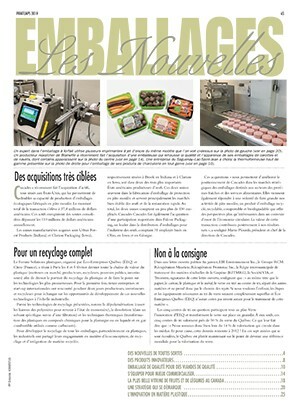 Once a long-time employee and shareholder of a thriving family-owned stretchwrapping equipment manufacturer Wulftec International, Côté found himself on the sidelines soon after the Quebec company was acquired by a big overseas packaging machinery conglomerate M.J. Maillis Group back in 2002—ultimately resulting in the usual management restructuring and downsizing that such takeovers inevitably entail. Rather than bemoan his fate and rage against the injustice of it all, Côté wisely decided to put everything he learned at Wulftec, and also during his time at the North American subsidiary of Italian stretchwrapping equipment manufacturer Robopac, to good use by starting his own company—specializing in the aforementioned stretchwrapping machinery, palletizing equipment, and related end-of-line material handling systems and equipment. Even more importantly, the startup company decided early on to hone its system integration skills in order to be able to offer its customers turnkey end-of-line solutions incorporating all three types of equipment it would make and market. 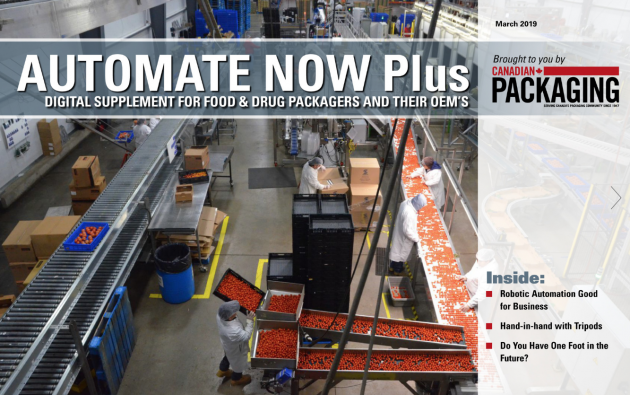 With Solutech celebrating its 10th anniversary this year, it’s safe to say that Côté’s entrepreneurial drive and instincts have been aptly rewarded in the highly competitive marketplace for end-of-line packaging machinery. Today employing 25 full-time staff at two side-by-side plants totaling up to about 24,000 square feet of production space, the company has expertly executed hundreds of successful machine installations in its primary bread-and-butter food-and-beverage markets across North America. In addition, Solutech has also performed several highly one-off system installations at massive industrial and commercial facilities operated by paper product giants Domtar and Cascades, roofing products manufacturer Soprema Group and the Government of Québec, among others. 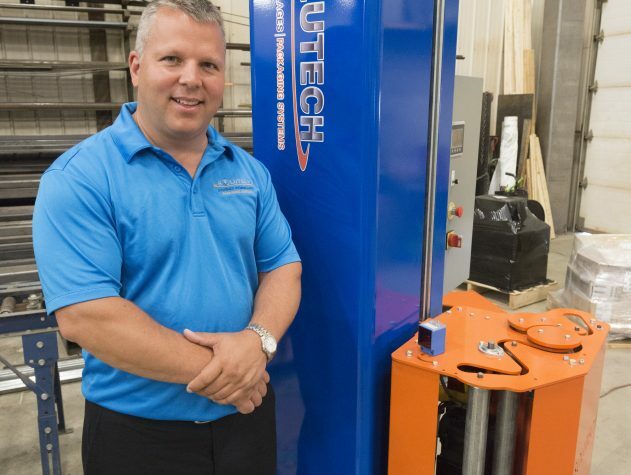 “Since starting out in my own garage 10 years ago, I had to move the company four times to keep up with the growth,” says Côté, saying he had full confidence in Solutech’s ability to succeed, despite formidable competition from the industry’s more established players. 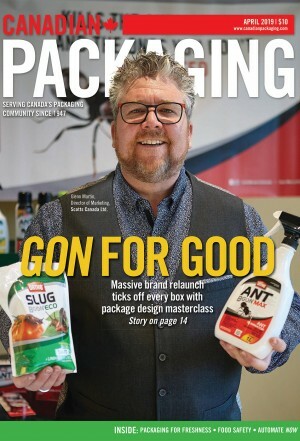 “We now have machines installed all over Canada and the U.S., along with a few in Mexico,” Côté told Canadian Packaging in a recent interview. “Having been around strethchwrappers for about 20 years before starting up Solutech, I always felt there was a gap in the marketplace for turnkey end-of-line solutions,” says Côté, “and filling that gap is what I thought would enable Solutech to carve itself a piece of the market pie. “There were a lot of people manufacturing just stretchwrappers and a lot of people manufacturing just palletizers,” Côté explains, “but there were not many companies providing one-stop-shop solutions to the marketplace. Considering that 10 years is a relatively brief period in any traditional industry, let alone the packaging machinery market dominated by venerable multinational heavyweights, the company’s scope of equipment offerings is truly remarkable—ranging from basic stand-alone semi-automatic wrappers to sophisticated, fully-automatic rotary-arm and orbital configurations capable of handling large truck tires, giant paper rolls, oversized wood panels and all other manner of bulky or awkward product loads. Côté says the Solutech equipment compares very well in price and performance against all of its main competitors, while offering some unique value-added features not found elsewhere. 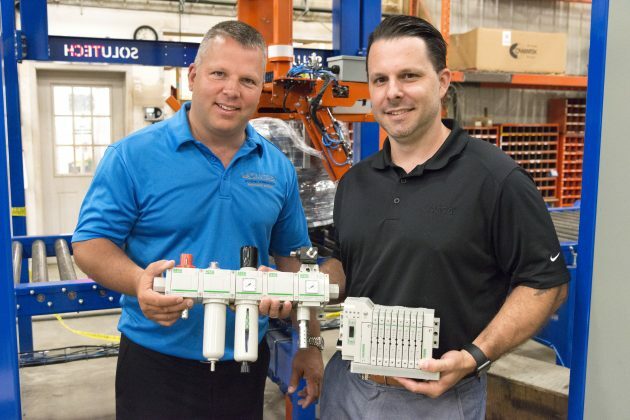 Solutech Packaging Systems founder and president Stéphane Côté (left) and Gaétan Larivière, local sales representative for the ASCO/Numatics division of Emerson Automation Solutions, hold up the high-quality pneumatic components from ASCO incorporated inside Solutech’s high-performance stretchwrapping machinery manufactured in Richmond, Que. The semi-automatic INTELLI-WRAP portable stretchwrapping system with throughout capacity to wrap 15 to 20 loads per hour. Designed as a cost-effective solution for busy distribution centers, the battery-operated system can provide up to 12 hours of completely autonomous operation from an eight-hour charge, according to Solutech, with its 20-inch film carriage capable of making light work of oversized loads. While the use of similar independently operating stretchwrappers has been gaining momentum in recent years thanks to their portability and extremely compact footprint, “To the best of my knowledge we are the only North American manufactures of these types of systems,” Côté asserts. “All the other ones are imported from Europe, where such systems were originally designed and commercialized,” he states. “I originally imported them myself but I found little success in marketing them,” he relates, “so about four years ago I decided to start making them myself. “I have sold about 50 of them since then,” Côté states, saying the user-friendly machine—looking more like a home appliance than an industrial equipment—stole the show at this year’s SIAL Canada 2018 food industry exhibition in Montreal. “Show visitors just couldn’t get enough of seeing the INTELLI-WRAP in action casually going about its business of circling around a pallet and stretchwrapping the stacks of product all on its own, load after load. “I got more solid sales leads from that show for this machine than I do at many of the packaging industry shows we exhibit at,” he chuckles. The SLP series semi-automatic turntable stretchwrappers, equipped with a pre-stretch film carriage installed on the side of the machine to provide optimal working ergonomics for the operators, while ensuring optimal film pre-stretch to maximize film usage. The SHP series high-profile stretchwrapping machines, designed to be loaded only by forklift. The SRT series stretchwrappers incorporating a rotary tower attached to a 20-inch powered pre-stretch carriage, which rotates around a stationary pallet load on the floor to optimize film usage. The automatic SLPA series low-profile turntable stretchwrappers and the SHPA series high-profile turntable stretchwrappers—both designed to allow the operator to start the system without getting off the forklift. The SRTA series rotary tower stetchwrappers. Also designed to allow the operator to start the system without getting off the forklift, the system automatically attaches the stretch film at the beginning of the cycle and cuts and wipes the film at the end of the cycle lowering the risk of injury for the operator and optimizing the wrapping cycle time. The automatic SCRTA series rotary tower system that can be inserted into an existing conveyor line, or installed as a stand-alone system. According to Solutech, the high-speed system is designed to index the pallet load automatically, securely wrap the load at optimal pre-stretch, and cut and wipe the film at the end of the cycle without any operator intervention. 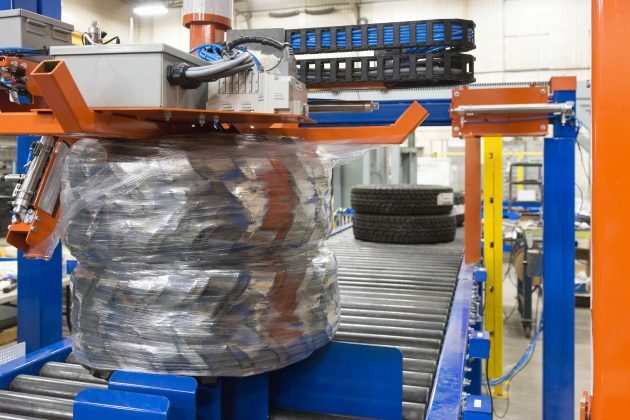 A fully-integrated end-of-line packaging system assembled by Solutech Packaging Solutions makes light work of preparing giant truck tires for a perfectly safe and secure shipment to customer. As Côté relates: “I am exremely proud of what our team has developed and brought to the market. “The latest integration of the new features, such as multilingual touchscreen technology, the use of only nonproprietary parts, and custom-made robotics integration enable us to go beyond our customers’ expectations,” he enthuses, “offering custom-made applications to fill any need and requirement. “Our robust machines are built last for years with total peace-of-mind,” says Côté, citing superior structural strength and integrity of all machine parts fabricated by Solutech. “The thickness of the steel we use on our turntables makes Solutech equipment one of the most hardworking machines on the market, period,” he extols, crediting the company’s expert staff, boasting a wealth of combined mechanical and electrical engineering knowledge, for helping Solutech establish a stellar industry reputation. “One of our greatest strength it is our talented, committed and passionate employees,” Côté states. In-house talent aside, Côté also credits the company’s various business partners for helping it succeed—reserving special praise for the ASCO/Numatics division of Emerson Automation Solutions in Saint-Laurent, Que. 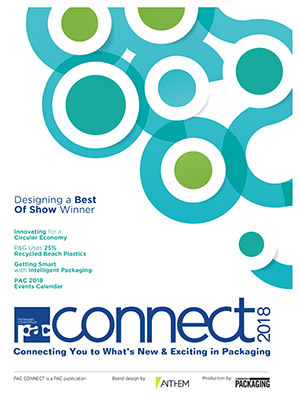 Says Côté: “ASCO/Numatics has been our choice for pneumatic components since Solutech started up 10 years ago, and their support has been instrumental helping us realize our vision of what top-quality stretchwrapping equipment should look and work like. The sentiment is resoundingly mutual, according to Gaétan Larivière, Emerson’s technical sales specialist for fluid and motion control products. 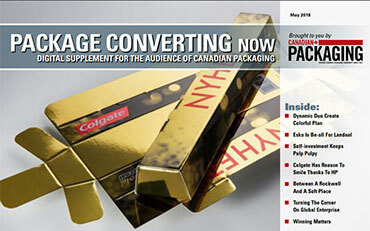 “We are proud of our partnership with Solutech Packaging Systems,” Larivière told Canadian Packaging. “We have been partners for many years now, and I’d like to think that we have played a part in helping Solutech achieve their impressive growth in both size and reputation. “By using real world-class components made ASCO/Numatics, they have been able to raise their technology to a much higher standard, while also adding a lot of value to their product portfolio,” says Larivière, praising the high level of collaboration between the two companies on all new projects initiated by Solutech. “We work closely with all their departments: from purchasing to engineering,” he states. “We help them with purchasing on day-to-day basis, keeping track of the orders and make sure that we are always on top of the game when it comes to price and delivery. “We also help their engineering with creating the 3D drawing for their designs, assisting them in conceptualizing new designs, or bringing additional information for their new product development,” he adds. The 651/652 Series air filtration line featuring modular construction with body-to-body clamps and end plates, which offers mounting versatility and enables quick product replacement, while leaving piping in place. The stainless-steel M Series pneumatics cylinder line, engineered to exceed all light-duty cylinder application requirements. According to ASCO/Numatics, “This reliable cylinder is reliable and is designed and built to maximize performance with a multitude of standard value-added features such as stainless-steel piston rods, roll-formed threads at both ends of the piston rod, and pre-lubed installation for lubrication-free service life. The Solenoid Pilot Valve-Manifold with a high-flow rate 11-mm pneumatic valve. Designed to save mounting space requirements and troubleshooting time, the four-way solenoid air pilot actuate valve is available in manifold with Fieldbus and is compatible with all leading industrial Ethernet protocols.